These events are open to the general public unless otherwise noted in details. Due to the overwhelming popularity of the W6SFM CW Beginners class the SFM ARC is gearing up to start another CW Beginners class starting September 14th 2016. Students in our class will all complete with a good grasp on their entire alphabet, numbers and CW Pro-signs. Students are taught proper Sending and Receiving methods. Students will be provided with a Morse Code Straight Key and an Oscillator to keep and use on-air with their home stations. The SFM ARC CW (Morse Code) class is a 10 week course held once per week for 2 hours. Our goal is to have all students on the air operating conversational speed CW by week 6. If you or someone you know is interested in attending our next CW course please email the club at admin@w6sfm.com for more information. We hope to see you there! Details are also posted on our course calendar. Technician. If you want to get started in “Ham Radio” and earn your first FCC license, then the Technician Track (combined “Pre-Session*” and “Session”) is the place to begin. General. The General Track is ideal for you if it’s time to upgrade your Technician’s ticket and work the exciting world of HF. Refresher. If you’re looking for a way to update your Technician or General knowledge without seeking a new License, the Refresher Track is for you. PRIOR to the first session (13 July 2016), please read Chapters 1 & 2 of your Track’s textbook. "Our next session will be on September 16, 2016 starting at 8:45 AM at the LDS Church, at the corner of Hazel and Cherry Ave in Orangevale, CA." Our exam sessions are now being held at 2486 Progress Drive in Redding. Exams start at 10:00 AM and candidates are encouraged to pre-register. This month's news features reports and photos from public service activities around our section. Thanks to the amateur radio operators and groups who volunteer their expertise and service to our communities. This month's National Parks on the Air focus is on the Whiskeytown National Recreation Area (RC18). Last month Roger and I operated a KP4MD/P "Suitcase DXpedition" with an Elecraft KX3 transceiver and both a Chameleon CHA-F magnetic loop and Buddistick antennas on a beach front condo balcony on the north shore of Puerto Rico. We logged 115 QSOs in 24 countries on 15 through 40 meters CW, JT65 and SSB. A total of 24,772 WSPR spots with Japan, Australia, New Zealand, North and South America, Europe, Russia and Africa were also uploaded to WSPRnet.org. We met with local hams, including ARRL Puerto Rico Section Manager Rene Fonseca NP3O and his family, Nilda WP4MMP and Tony Santiago KP4IA, and members of the Virgin Islands Amateur Radio Club. One new task that I take on this month is serving as District 6 Chair (California) for the Young Ladies' Radio League (YLRL), ARRL affiliated and founded in 1939 with a current international membership of about 1,100 YL (Young Lady) ham operators. The YLRL's primary purpose is "to encourage and assist YLs throughout the world to enter into the Amateur Radio Service." The YLRL encourages YL participation through YL contests, YL nets, member news in the bi-monthly journal YL-Harmonics, and also sponsors scholarships for YLs who pursue education in communications and electronics or related areas (science, technology, engineering and math). The majority of newly licensed YLs are Technicians. More YL role models and all Elmers are needed to reach out and welcome both new and inactive YLs and encourage them to get on the air and to upgrade and join our mainstream amateur community. (A YL net "Ladies of the Net" meets on 7245 kHz LSB weekdays at 10:00 am Pacific Time). We see new opportunities to include YLs in our youth outreach through the Maker movement and through helping to implement the new ARRL "Radio and Wireless Technology" Patch Program in our local Girl Scout troops. This is good for the growth and health of our entire amateur community. Please do encourage YLs on the air, in your communities, and in your clubs to join this mission to welcome more YLs to our fascinating hobby by contacting me or the YLRL. Please contact me if you are interested in attending or assisting with planning a YL forum at the ARRL Pacificon Convention. Register online now at www.pacificon.org for the October 14-16 ‪‎Pacificon‬ ‪‎ARRL‬ Pacific Division Convention at the San Ramon Marriott. PACIFICON is the annual ARRL Pacific Division convention, held each year in October. It is THE premier amateur radio conference in the western U.S. If you do not plan to attend the Pacificon convention, consider reaching out to your local Brownies, Cubs, Boys or Girl Scout troop to offer an Amateur Radio demonstration and to support their participation in the Oct. 14-16 Jamboree on the Air (JOTA) to communicate with other scouts around the world. Offer to help your local Brownies, Cub Scouts, Girl Scouts and Boy Scouts earn the Scouting Radio Merit Badge and the ARRL Girl Scout Radio and Wireless Technology Patch. Our website, Facebook and Twitter pages are a work in progress, and your suggestions and submissions are always welcome. You can still send items for the August news to kp4md(at)arrl.org. I try to update this news page by each the weekend after submissions are received. The Girl Scouts and Boy Scouts (Pioneer Express District) have invited us to provide an amateur radio booth at the Saturday, September 24 Golden Empire Council Scout Flag Retirement Event at Gibson Ranch in Elverta. From 300 to 500 Boy Scouts, Cub Scouts, and Girl Scouts are expected to attend the event that lasts from 8:00 am to 5:00 pm and features exhibits and booths related to scouting. 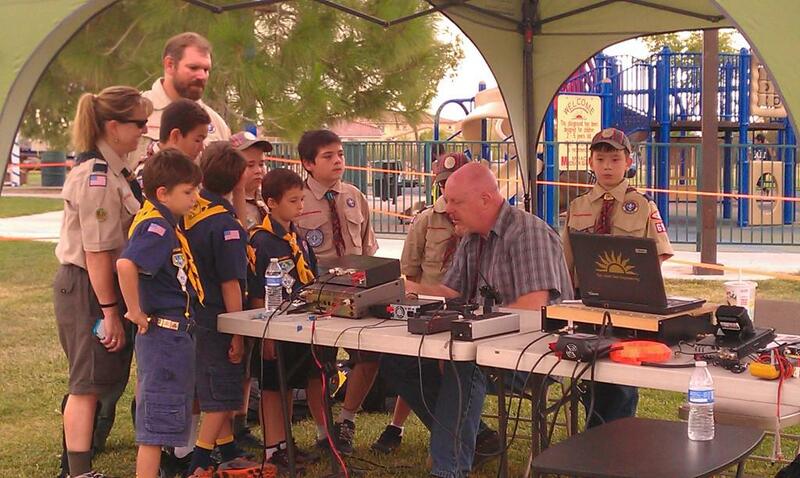 The Amateur Radio booth would consist of one to two canopies with tables, promotional and informational literature on amateur radio, local clubs, the ARRL, the Boy Scouts Radio Merit Badge and the Girl Scouts Radio and Wireless Technology Patch, Morse code practice stations, working HF and VHF stations (preferably with battery power), and opportunities for Scouts to communicate on the air. Booth volunteers are needed to answer inquiries about amateur radio and licensing and as station control operators. We should not miss this opportunity to promote our area radio clubs and to recruit youth into amateur radio. Your club may decide to follow this event up with support for a local scout troop to participate in the October 14-16 Jamboree on the Air. If interested in helping to plan and/or participate in this September 24 youth outreach activity, please contact me promptly at kp4md(at)arrl.org. The ARRL Sacramento Valley Section will sponsor an exhibit promoting Amateur Radio at the Mini Maker Faire at Sierra College in Rocklin on Saturday October 1 from 10 am - 5 pm. We plan a display of homebrew amateur radio equipment and antenna projects, Morse Code practice stations, and offering opportunities for attendees to learn about the many facets of the amateur radio and to communicate on the air with amateur radio operators via an operational on-site amateur radio Special Event Station N6M. We will offer literature and information on licensing, local clubs, the ARRL and amateur radio's role in community service and promoting careers in Science, Technology, Engineering and Math. *Although some sites such as Sutter's Fort and the B.F. Hastings Building are under California State Parks administration, NPOTA activations may be conducted there with appropriate permission. "Operations within 100 feet of National Historic Trails are permitted at any point along the route. Operations from private property must receive permission." See NPOTA Rules 13(k) and (m). ARRL Headquarters advises amateur radio operators to contact and register with the corresponding local NPS unit administration in advance to inform them of planned NPOTA operations within their entity. Visit http://www.arrl.org/NPOTA for more information. Follow NPOTA activation updates on npota.arrl.org, Facebook and Twitter. Do you plan an NPOTA activation in our section? Send e-mail to kp4md(at)arrl.org for posting on this page. The Whiskeytown National Recreation Area is a United States National Recreation Area in northern California. The recreation area was established in 1965 by the United States Congress. Recreational activities available include swimming, fishing, boating, camping, and hiking. 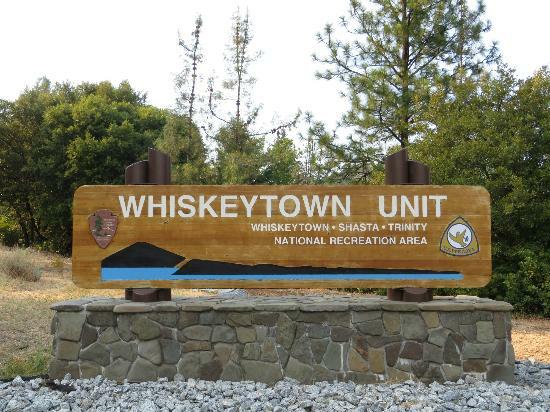 Whiskeytown was one of Shasta County's first gold mining settlements during the California Gold Rush of 1849, though at the time it was called Whiskey Creek Diggings. There are two different stories for how the settlement got its name: The first states that a barrel of whiskey fell from a pack mule and into the creek that ran by Whiskeytown; the second attributes the name to the legend that miners at Whiskeytown could drink a barrel of the hard liquor a day. The area became known as a good place to mine for gold. The Redding Record Searchlight reports miners averaged $50 in gold per day, and in 1851 a 56-ounce gold nugget was found. The first white woman arrived in town in 1872, and by 1855, about 1,000 gold miners lived in Whiskeytown. The post office was opened in 1856, but the federal government didn't allow the Whiskeytown name to be attached to it because it was considered inappropriate. Finally, in 1942, the federal government agreed to name the post office after the town. Construction of the Whiskeytown Dam began in 1960, and the basin began to fill with water in 1962. Some Whiskeytown buildings were moved to higher ground, but others remain underwater. The dam was dedicated by President John F. Kennedy in 1963. Visit the National Parks Service website to find the Whiskeytown National Recreation Area and other NPOTA entities near you. NPOTA activations may be conducted with permission from sites along NPOTA trails not under NPS administration with proper permission. Be sure to read the NPOTA activation rules and instructions and register your NPOTA activation for a truly enjoyable experience and public outreach! On Tuesday the 9th of August I will be activating Lassen Volcanic NP38. On Wednesday the 10th I will be at the Lava Beds MN50 and then on Friday the 12th I will be at Crater Lake NP13. I may be at Tule Lake unit NM31 on this trip too, we will see. Each day I will start between 1700 to 1900 UTC. This depends on traffic and finding a place to set up. Lassen is going to be interesting, it is their “free day in the park day.” I will be doing PSK, JT65HF, RTTY and SSB on 40, 20 and 15 depending on band conditions. On 20 I will try to be around 14.170 and 14.345 MHz. I’m the one of the Northern California DXCC, WAS, and VUCC awards Manager and if you have an application and cards to be checked let me know. I will set time aside to do your applications and check your cards, but I do need to know ahead of time, contact information is on the ARRL web page under card checkers or leave me a message on my face book page. I will also be checking my wb6vyh@comcast.net all week. Hope to hear you all on this trip. Bob will be at the Lincoln Ham swap in September and most likely Ham Club meetings throughout Northern California. The Sacramento County ARES February training meeting will be Saturday, August 13, from 0900-1200 hours at To Be Announced. On July 16, 2016, over 20 amateur radio operators gathered in Sacramento, CA to support the 43rd Annual Eppie’s Great Race. The Great Race is known as “The World’s Oldest Triathlon”, it is also the largest paddling event in the United States. The race consists of a 5.82-mile run, a 12.5-mile bike and a 6.10-mile paddle held along the scenic American River Parkway in Rancho Cordova and Sacramento. This year the event drew more than 1000 participants. Sacramento Valley Section Emergency Coordinator Frank Reshke, N6SNO, who has been the communications coordinator for the event for the last 29 years, pulled together teams of operators to monitor the entire course. The radio operators' hard work and radio communications skills helped insure the success of the Eppie’s Great Race. Everyone did a fine job communicating the bib numbers of the leaders, and notifying net control of potential problems. The medical teams and Park Rangers depend on the radio operators to quickly call in potential injuries so they can dispatch medics or rangers to locate and assist participants. Everyone is looking forward to the 44th Annual Eppie’s Great Race. The Modoc Emergency Radio Club, K6MER, helped out on July 23 with two aid stations and two SAG wagons for the second annual reboot of the Great Historic Hotel Bike Ride that ran from the Fort Bidwell Hotel in Fort Bidwell to the Niles Hotel in Alturas. Traveling south from the top of Surprise Valley, bicyclists enjoyed views of the Hayes Mountain range to the east and the Warner Mountains to the west. Riders then climbed 1650 feet in order to reach Aid Station One before biking over Cedar Pass at 6300 feet and on to complete either the 100 kilometer (62 mile) or the 150 kilometer (93 mile) ride. A couple of riders started on the western slope of the Warner Mountains to complete a 40 kilometer (25 mile) stretch of the course. Members of Modoc County’s ARES club met the challenge of providing continuous communication regarding the status of the riders through use of the Payne Peak repeater, the Barnes repeater, and a mobile relay station. Radio club members look forward to participating in this event in order to practice implementing Incident Command System (ICS) protocols. District 1 Emergency Coordinator Jim Linden, N7JIL, acted as Incident Commander (IC) for the event. Chad Linden, N5BMU, served as Net Control. Modoc Emergency Coordinator Dan Stossmeister, KJ6ZUW, operated SAG 2 while Jason Keen, KJ6PZR, operated SAG 1. 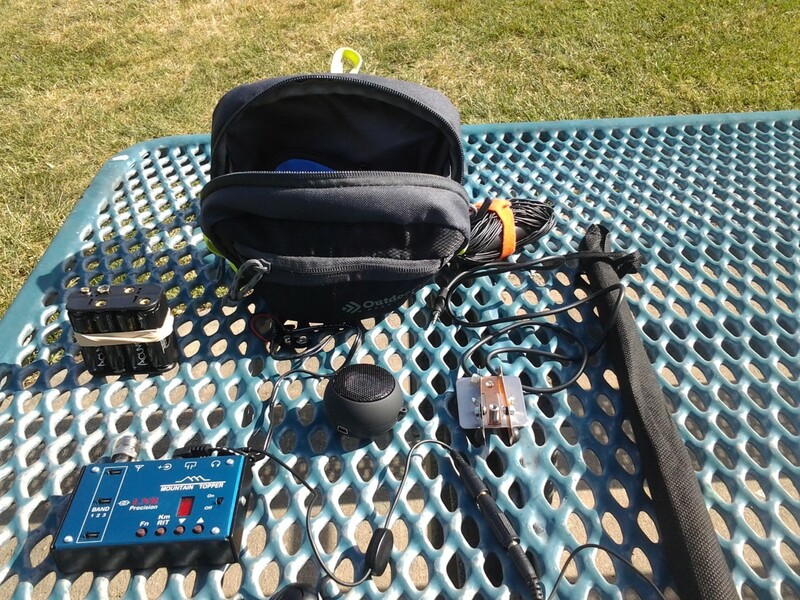 Surprise Valley High School’s Amateur Radio Club (KK6YBB) had club member Maya Schulz, KK6TBY, posted in Cedarville to direct riders toward the correct route and to report bib numbers to Net Control. Greg Small, AD6OO, kept track of riders at Aid Station One. Richard Mund, KK6FBZ, reported to Net Control from Check Point One. Marie Linden, N6REE, reported from Aid Station Two. Ron Sharpless, N7ERC, greeted riders at the Niles Hotel, the course’s end, after seeing at least a couple of the riders off at the 40 K Start. Other club hams involved in the event included Jim Hertel, N6KMR, operating the mobile repeater, Corben Chilsen, KK6SJA, offering relief transportation, and David Schulz, WO6M, monitoring the mobile cross band repeater. The Great Historic Hotel Bike ride was sponsored by Modoc Parks and Recreation District. This historic bike ride follows a route that used to be popular in the 1990s. Special thanks to all of those who provided water, snacks, pastries, electrolytes, and portable facilities at the start, the finish, and each of the aid stations. More riders participated in the event this year, as compared to last year. Riders and volunteers enjoyed a late lunch after the event. Cell phone communication is unavailable for considerable portions of the route making Amateur Radio the most reliable means of communication for the event. Recently, members of Sacramento County ARES got together to build a 20/40 meter trap dipole antenna with a homemade balun. This was a fun project that gave us an opportunity to get some hands-on experience with antenna making. Members built their own baluns (a simple 1:1 voltage balun) and a pair of 20 meter coax traps. We then took wire and assembled the antennas, then hoisted them up and tuned them. We ended up with a useful little antenna that works verywell on 20 meters while giving good performance on 40 meters with the added advantage of being shorter than a standard 40 meter dipole. Builders were Carl Chapek KK6RAS, James Chin KK6FON, Eric Guenzler KG6BZT, Jennifer Hughes NS3O, Terry Johnson KI6KWX, Dennis Klaman N6KLA, Mike Meighan KD6ILC, Robert Reis KK6HZF, Lee Rominger W6LFR, Noel Seeley KJ6WOK, Bonnie Sellstrom KJ6WOK, and Tim Thorson KD6HOF. Fred Sellstrom W7KOZ and Mike Abernathy NM3S assisted the builders. Fred and and Bonnie Sellstrom were also kind enough to invite us to use their shop and land to do the build. Fred also set up a very nice rig for hoisting antennas up for tuning and helped everyone in numerous ways. Click to read photo story. We are looking for amateur radio communication volunteers to help support Ann Trason’s (Overlook Endurance Runs) 50K and 30K running event on October 15th, 2016. This event covers areas of the historic Western States Trail, Tevis Cup Trail and the American River Canyon. The 50K distance starts in Stone's Brew in Foresthill, CA. The 30K distance starts at Driver's Flat and Foresthill Road. Both distances finish at the American Canyon Park Overlook (Auburn Dam Overlook) in Auburn, CA. If you are interested in volunteering please send email k6sat@arrl.net indicating your interest, availability and contact information and I will contact you directly to confirm. A couple of the aid stations are on fire roads and so high clearance vehicles or 4WD is ideal. More information about the Overlook Endurance Runs and this event can be found here: http://www.trasonevents.com/overlook-endurance-runs/race-info/ This event is conducted under the auspices of the non-profit 501(c)(3) BAUR (Bay Area UltraRunners). I hope this message finds all of you well and happy. It has been another slow month for me due to my sore feet but I am getting along in spite of them. The VA came through with a set of orthopedic shoes that has reduced my discomfort considerably. Some people complain about the VA but not me. They are doing quite well on my account. Well, enough about me, on with the show. Anyway, 2016 is huffin' on to a finish and it is not to early to consider who you would like to see as next year's officers. We are fortunate to have some really dedicated people in the club and I encourage all of you to consider making yourself available for service as a club officer. Its not hard work but it does require a small additional amount of your free time, mostly geng to the monthly meeting about an hour ahead of time, and performing the other duties of the office. Well, that is about all I can think of except to urge you all to support our Nets on Mondays and Tuesdays. Will Nancy ever log 25 persons on the Tuesday night? Be there and find out. You can help and it'll be fun. I hope to see you all at the monthly meeting on this coming Thursday, the 25th. The OARS Monthly Breakfast will take place this Saturday, 27 August 2016, 9 am, at The Waffle Shop, 2107 Feather River Blvd (across the street from Applebee’s) in Oroville. Hope to see everyone there. PS Sorry for delay getting this out—things are still settling down after XYL Trudy’s medical crisis last weekend. At the 7:00 pm August 10 meeting of the Sacramento ARC, Dr. Carol Milazzo, KP4MD, will present a 40 minute video documentary "An Insider's Tour of the Arecibo Observatory." 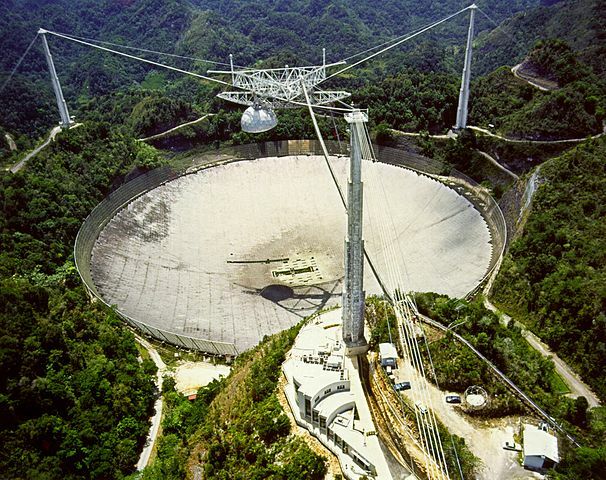 Filmed on location in Puerto Rico, retired engineer Bob Zimmerman, NP4B, narrates an exclusive inside look into the communications technology and workings of this famous world's largest radio telescope, The National Astronomy and Ionosphere Center. Visitors are welcome. Sacramento ARC General Meetings are held at 7:00 PM on the second Wednesday of each month at the Sacramento BloodSource, 10536 Peter A. McCuen Blvd., Mather, CA 95655. These monthly meetings generally include a presentation by a guest speaker on topics of general interest to the club membership. This past week I celebrated (no, not with a new rig like Rick) my 65th birthday. I know that I am still just a kid to some, but as I think back to what all I have seen and experienced in my life so far, what technological advances have taken place since 1951. When I think about what amateur radio was like when I entered into it in 1965 – wow! Just try to imagine 1939, the year our wonderful club was formed. I wonder what the Chico area was like then? I imagine that most of our founding members were doing mostly homebrew (not store-bought) rigs, which were separate, transmitters and receivers, not transceivers that took up a lot of real estate on their operating table. I am sure most had their station in the garage or the classic backyard shack, and that most every antenna was homebrew. When our club was founded on August 13, 1939, just 2 days later Dorothy, Toto and friends would grace the big screen for the first time in the Wizard of Oz. In Cincinnati, Ohio a double header at Ebitts Field between the Reds and Brooklyn Dodgers would be the first televised major league baseball game, experimentally broadcast by W2XBS. Franklin Roosevelt was our nations president and there were only 130 million in our country. We have a rich heritage of hams reaching out around the globe wirelessly from our area through these 77 years. Imagine all of the new budding hams that got their beginnings in ham radio because of our club, and new hams still are. For so many years we hams were all on HF only! Look at all of the options that we now have, the many modes and wide frequency spectrum available to us. We still have the option of keeping those glow-in-the-dark rigs on the air, making those contacts just like so many of our predecessors did. Or, we can integrate our computers with our radios. Think about it, our license is our ticket to talk across the street or into space, a privilege that we earned but still available to anyone. As a way to relive some of the history of our hobby, we have the opportunity to visit the “shack”, really a museum of Jerry Fuller, W6JRY and see the progression of rigs (transmitters, receivers and the like) from the 1920’’s through the present. Jerry has quite a collection of restored, working radios that are quite the treasure to feast your eyes on. And for us brass pounders like myself (CW operators), he has a collection of approximately 100 keys! If interested in making this visit to Jerry’s here in Forest Ranch on Saturday, August 13th at 12:00 noon, please contact me. Afterwards my wife Ida will be throwing burgers on the grill with all of the fixing’s here at our QTH for anyone that would like to come on by, just 5 minutes from Jerry’s. The next general YSARC membership meeting will be a dinner and social time at Tasty Buffet in Yuba City, 840 Gray Ave. A drawing will be held. We will meet Tuesday, August 2 at 6:00 p.m. in the Buffet Room. Tasty Buffet is next to where Kmart was located. Adult $11.49 per person, children 3-9, $5.49 per person, over 60 years-10% discount. At our June meeting Wade LaRue (KN6WX) and Chris McLain (KK6VZD) gave talks about antennas. Wade discussed W1SFR KX3 9:1 UnUn QRP antenna. The 35 foot EndFed 40 m to 6 m antenna is a field antenna that weights about 8 ounces you can make for QRP ops and is especially well matched with the KX3, FT-817, the KX1, and any other QRP rig with a tuner. For more information go to https://kx3helper.com/endfed-40-6m-antenna/ or you can visit the Emergency Amateur Radio Club of Hawaii (earchi) for plans to build one yourself. Chris showed off his homebuilt spiral antenna and discussed some of the modifications he made. One such modification is the addition of outer PVC rings to protect the helical coils. Another modification is fastening the antenna wire to the PVC using tie wraps instead of glue. For more information search for HF spiral antenna. The next VE session will be 3 Sep at 715 King Ave., Yuba City at 9:00 A.M. VE’s are needed to administer the exam. The elements for Technician, General and Extra class will be offered. If you are planning on taking an exam you will need two forms of ID, at least one of them must be a picture ID. A fee of $15.00 is required. A calculator may also be used as long as it has had all of its memories cleared and there are no built in or preprogrammed formulas. If you take an exam and pass, you can take the next higher class exam for no additional cost. If you do not pass and wish to try again an additional fee will be required. Congratulations to new technician George Rebane (KM6DYA) who passed the test with score of 100%, Antonio Santiago Ramirez (KK6YFS) for upgrading to general, and to Dan L. Holmes (KM6CTH) for upgrading to extra. Another great month of outdoor fun was reported at our latest in-person meeting. The W6SFM Samuel F Morse Radio Club meeting was called to order by club President Mike, N6MQL on July 7th at our regular meeting place in Carmichael at the Carmichael Presbyterian Church. A total of 12 members and 2 guest were in attendance. The club welcomed 2 new members who joined us this last month. Steve, K7SF from Portland OR and Ralph NA6D from the Sacramento area. The meeting was started with President Mike, N6MQL reading the Month's budget report and announcing our current funds available. Club Secretary, Chris, AI6U followed by reading in our minutes from last month's meeting. Chris also reported on our totals for our W6SFM On-line/On-air net meetings for the month of July. Snacks at the in-person meeting were provided by member Bob, K6DGQ. Topics of discussion included various ARRL section news and club business. The amateur Radio Parity Act (Hr1301) was discussed by the entire group in attendance. Also discussed was the National Parks On The Air (NPOTA). This year's Field Day results were also announced at our meeting along with stats on our operations. As like the past 3 years, the SFM ARC Field Day was held in the field at the rear of the Carmichael Presbyterian Church. W6SFM was on the air operating as a 2A SV station. The club saw 14 members and 18 guests, for a total of 32 participants. Five of those were children under 15 years of age. Of the 5 children that attended 2 of them got on the air in CW making 10 assisted contacts. The club was also fortunate enough to be visited by both the ARRL section manager (Carol, KP4MD) and the Captain of Sacramento Metro Fire station 109. Videos of the event are available in our Videos section the w6sfm.com website. For our Tech portion of the meeting members Kevin, KR6AI and Bob K6DGQ demonstrated Items that they brought with them to the meeting. Kevin Demoed his Home Brew "Dit tamer" he uses to slow his Millennium Vibroplex Blue Racer Bug down from 22 WPM to below 13 WPM speeds. Member Bob, K6DGQ displayed his Heil "Pro7" headset and Microphone combination. Bob explained to the club that even with use of hearing aids he is comfortably able to hear and wear his over the ear "cup" style headphones for many hours of operation. At our Aug meeting we will be discussing the clubs Day in the park get together. Vice President Rob, N6KIX will offer a brief presentation on the proper making of a QSL card. Rob will explain the restrictions and complications due to their size while sending via Post Card mail or the 2 standard size envelopes. As usual, current events, News regarding Amateur radio and other ARRL items will be discussed. We will have our Tech (show and tell) portion where members and visitors are asked to share their Ham Radio related items they find of interest. Feel free to visit our In-Person meeting with items that you purchased or were given that you would like to share with the group. Visitors are always welcome to join us. Each Tuesday of the week 8:00 PM on 3.545 MHz the SFM ARC enjoys getting on the air with CW for our weekly Nets. You do NOT need to be a member of the SFM ARC to check into our nets and we encourage you to invite a friend to join us as well. Although our nets usually run around 13 wpm code, we are all happy to accommodate those that are slower and need us to oblige. If you are unable to copy Morse Code or need some code practice please feel free to visit our on-line LIVE streaming broadcast of both the Audio and a CW to Text decoding of the meeting. The “LIVE FEED” link can be found on our home page of our website. Those visiting the on-line site are welcome to make themselves known by using the ‘contact us’ link to let the net op (NCS) know you are there. This of course is not mandatory, just a way of making everyone feel more involved in our on-air nets. Do you know someone in need of a Ham Club to call home? Perhaps someone that wants to learn Morse Code, are interested in CW or already know and use it, the SFM ARC would love to be their new Club home. Our in-person meetings are held each 1st Thursday of the month at 7PM. Please use the rear parking lot and entry for best access to the meeting. A map and directions can also be found on our website. We hope to see you at our next meeting! Good things actually come in small packages. Kevin Hooke, KK6DCT demonstrated the Raspberry Pi at our last meeting giving all of us a look into the future. The club is also looking to the future by trying something new at the next meeting August 2. Ed Fong, WB6IQN will give his presentation by SKYPE. It should be really an interesting evening. I had the pleasure to listen to Ed at the Pacificon Antenna Forum and he is a great presenter. From what I understand, we will be able to make a group order of his antenna if we want. But wait – there’s more. Just three days earlier on Sunday, July 31 we will hold our annual member picnic. We will be celebrating our 40th anniversary. Don’t forget to attend. The Martins will be at the grill and I’m looking forward to another great picnic and Fox Hunt. In September, in person, our club will hear from Bud Drummond, W3FF from Buddipole. His antenna system can be configured in multiple ways. His demos are always something not to be missed. Our White Elephant sale is coming in October so it’s time to start cleaning out the shack. A few items have been already donated to the Club and living in my garage. They will make the trip to the meeting. As I write this, the tower is about to be delivered. If it really shows up, then the real work begins. I think I will become a personal friend of those at DX Engineering and HRO. Figuring out coax loss vs cost will be a test. Hopefully the ground will not be too hard to trench! When: Saturday 30th of July. Time: 11:30 am Social Hour; 12:00 pm Lunch, 12:30 pm Program. Payment of $20 can be via the club's PayPal account (paypal@nccc.cc) or at the door. Please confirm your attendance by EOD Thursday 28th July! As you may remember reading in the last Newsletter, SFARC planned a little different Field Day this year. The plan was to run from batteries and solar only, transmitting with only 5 watts, about the power level of your bathroom nightlight, someone said. We erected excellent wire antennas this year, like a 300-foot loop at 70 feet, and a 40m bob-tail curtain pointing East. SSB was challenging, as might be expected with QRP, while CW and Digital modes were productive. 17 operators tried their best on three different modes, and when the final bell sounded, we were surprised at the results. The fact is, we made less than half the contacts of last year, but due to the 5x multiplier for QRP, we beat last year’s points score by over 400. Total contacts made was somewhere in the 400’s, (remember, QRP folks), but the final points tally with bonus’ was over 5,000! A highlight of the 24-hour operation was youth participation. Jeff’s (AK6OK) grandson Noah made at least 20 Q’s at the mic, while another youth did almost as well. In any case, everyone had a great time. Our public information table was a hit with an “active map” tied to the N3FJP logging software that displayed states worked in real time on an LCD monitor. The Saturday night potluck offered good food as usual with tri-tip and chicken and all the trimmings. Our custom Field Day T-shirts this year were a stand-out hit as well, and made it easy to find Club members as visitors strolled around the site. Of course, no Field Day report, or antenna raising worth reporting, would be complete without AK6OK’s awesome, air-powered, tennis ball shooting cannon to get those wires up high. This thing reminds me of the air cannons at the end of the Boardwalk in Santa Cruz … if you weren’t expecting the noise, it made you jump, every time! The Club is already looking forward to next year … will it be another QRP-only event, who knows? One thing for sure, it will be a great time for everyone who decides to come up to Nyack near Soda Springs. We hope to see you next year as an operator … or visitor. Lots of things to talk about in this newsletter. The first thing is a shock! Amateur Electronics Supply (aesham.com) is going out of business! I thought someone was pulling a joke when I read it but I found out it is true. Lots of sad stories on ham websites about how people bought their first radio from them, were advised on what equipment goes with what gadget, etc. I know that I personally have bought lots of stuff from them including 4 radios (a Kenwood TS-2000, a Kenwood TH-F6a (the best HT ever), an ICOM IC208H (great radio with a tiny detachable faceplate that fits in the sunglass holder in my car roof), and, just tonight, a Yaesu FTM-3800DR, a 65 watt 2 meter analog and digital mobile (Yaesu System Fusion C4FM to go with the DR-1X repeater). This radio has great reviews and is the hot setup to use with the WPARC repeater for both digital and analog FM. We now have a C4FM net at 8:30 PM Monday nights and it is growing rapidly (W6ETJ, Erik, is net control). There are several people with a lot of System Fusion experience to help you out with any information you may need. The net starts in analog so you can ask questions before the net switches to digital in case you don't have a C4FM radio but are considering purchasing one (or winning one at the Hamfest!) The net is open to everyone, not just WPARC members. The two First Prizes are something many of us are familiar with now: BaoFeng UV-5R Dual Band HT Two Way Radio. These are very popular radios and are handy to keep in the car, backpack, or on your belt. We will also have several smaller prizes. Make sure to be there to win big! The third thing tonight is Field Day. The results are in and the club did very well with Jerry N6JKH leading as event organizer. We will discuss the results at the July WPARC Meeting Tuesday, July 19th at the Woodcreek Oaks Golf Club in Roseville. Join us for lots of merriment Tuesday night! The meeting starts at 7:00 PM but most of us come early for food and drink and to spin yarns. We didn't miss many states this year but the ones we did are mostly eastern states – Tennessee and Kentucky stick out because there are lots of hams there. I really missed not being able to be part of the fun this year but you can be sure I will be there next year. Important Note: Frank KB6KYK has been the club Drawing Master for many years and has done an exceptional job finding goodies for us. He now has some other concerns to deal with and will not be able to continue as Drawing Master. If you would like to help out the club and volunteer, please let any board member or Frank know. LC N7VQC is still on the job with the club repeater. He made a new shelf to hold the radio itself and mounted a 5” 120 volt fan in the shelf it to keep the radio cool on the hot days and during nets. LC has done an outstanding job of configuring the repeater and making sure it is up to the job we ask of it. If you have a chance, thank him. The club website, http://wparc.us/index.html, has a new look and new information. Jey KQ6DK is now Clay's (K6AEP) backup and is updating the the site. Clay has been traveling a lot and has not had time to keep up the pages. Although Clay's traveling is over for now, Jey is helping out and bringing a new look to the site. Thanks to Clay and Jey for all their work on the website. Want more? We now have a Twitter account! Just search for @k6pac (the club repeater call sign with the “@” symbol). We are following the ARRL, the ARRL Sacramento Valley Section, Kenwood, and Yaesu for a few. If you think of someone we should follow, please email me. I know there are a few local clubs with Twitter accounts and I will add them. August 4 – 10 meters (28.410 MHz) A good chance for Techs to join in! NEW! We now have a Monday evening C4FM net! Featuring Yaesu System Fusion radios, this digital net is at 8:30 PM on the club repeater and is hosted by C4FM guru Erik W6ETJ. As noted above, the net starts in analog so you can ask questions, etc. This net is growing fast (I know one more person who will be on this Monday night!) so check in now and join the fun! The next big event we have coming up is the WPARC Hamfest on September 17th at McBean Park in Lincoln. The gates open at 7:00 AM but we need several volunteers to be there around 5:00 AM to set up and to control parking for buyers and sellers. Katy KJ6YCP has been coordinating the hamfest for several years and does a terrific job every year. If you would like to help out please email Katy at entertainangels@surewest.net. This is a big event for the club and how we operate it reflects on the club so please volunteer. We all (and especially Katy) appreciate it. We have our city permit and our liability insurance in order so the event is set to go. I have mentioned many times that I use Amazon Smile for my shopping on Amazon. Smile is a program Amazon has that donates .5% of all of your qualifying purchases to a non-profit of your choice (and that participates in the program). The ARRL is my choice and I saw today that I have made 105 purchases that qualify. I buy some medical supplies and bulk items on Amazon so I am confident that the ARRL has benefited from my purchases. If you buy anything from Amazon, please enroll in their Smile program and make the people at ARRL HQ smile! Remember the club meeting is Tuesday night at 7:30 at the Woodcreek Oaks Golf Club in Roseville. See you there! Alison, KS6Q and I, KS6Z have activated 18 National Park units so far and are now in Alaska activating more. We just activated the Wrangell-St. Elias National Park and will be going to the Kenai Fjords National Park next. We have really enjoyed this National Parks On The Air celebration the ARRL instituted this year and being a part of it. Please join us on the air as we continue to activate in Alaska. mostly on seventeen meters because of the distance. Check out the On The Air page at npota.arrl.org to see the dates of our upcoming activations. Thank you for your contributions and service to the ARRL Sacramento Valley Section! I enjoy reading the Section Valley News each month. It is my favorite radio publication I receive each month! I attended my first field day last month, and made it to the River City ARCS, SARK's, and SHARP's field day events. It was a busy 24+ hours, and I had a blast. Thank you!!! !